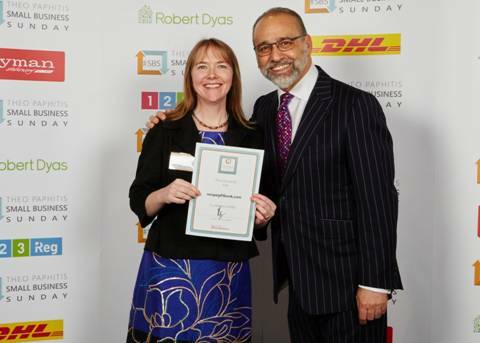 CORRIE JONES, founder of recipegiftbook.com, a Machynleth based on-line alternative wedding gift list service, has collected an award from entrepreneur and former Dragon’s Den celebrity, Theo Paphitis. recipegiftbook.com received the award at the 2017 Small Business Sunday (#SBS) convention, which was held on February 3. The event was a culmination of the retail magnate’s regular #SBS contest on Twitter, where every Sunday he invites small businesses to pitch to him about their business through twitter. The following day, Mr Paphitis reviews the thousands of entries from across the country and selects his favourite six to retweet to his over 500,000 followers. recipegiftbook’s successful entry was chosen in August of last year, with the business since enjoying plenty of perks from joining the #SBS winners community, including an invitation to the official winners event in Birmingham. There was free training and small business support on offer during the day which included a ‘Question Time’ panel with Dragons Den Deborah Meaden and John Mills; founder of JML. Corrie’s winning business recipegiftbook.com enables couples to receive the personalised gift of a recipe. Friends and family add their recipes, photos and a personal message online and the couple receive a free hardback recipe book following their wedding. It’s a unique wedding keepsake that could become a lovely future family heirloom.